Standing buck-naked in the Rio Grande River, a river-bend upstream of our overnight camp at Lower Falls in the Lower Canyons section of the river between Texas and Mexico, I braced against the current and started wringing the Dr. Bronners hemp soap from my tattered paddling pants when I heard what I knew to be the echo of a rifle shot. I looked around, thinking that execution by shooting squad seemed a bit harsh a penalty for indecent exposure in the wilderness, but mostly wondering what I had blundered into. In the back of my mind, I recalled the Park Rangers warning about backpacking drug runners, a shooting several years before, and reminders for our canoe group to stay together. A second shot rang out, and I decided my clothes didn’t really need that extra rinse cycle. Another member of my group popped his head up from behind a riverside boulder: “You’d better get back to the camp, we’re being shot at.” No arm-twisting was required, and I pulled on my now pepperminty pants and hustled back. View of our campsite from the top of the bluff. We were fairly sure they were trying to shoot just close enough to scare us, but at that distance, we knew they didn’t have to be many clicks off to…well we gambled that they were good marksmen who had left the beer at home. Having a satellite phone along, we decided to try to reach border patrol. Over the next 40 minutes or so, we had the surreal experience of being put on hold, referred to others, and handed around, all the while being interrupted by gunshots at irregular intervals. Making it more frustrating was that we’d only have phone connection for 4 or 5 minutes at a time while a communications satellite passed in the narrow gap between the canyon walls far above. Exasperated, we tersely told one last person our location, “politely” yelled again that we were under fire, and hung up, just as the shooters tired of their game and left. 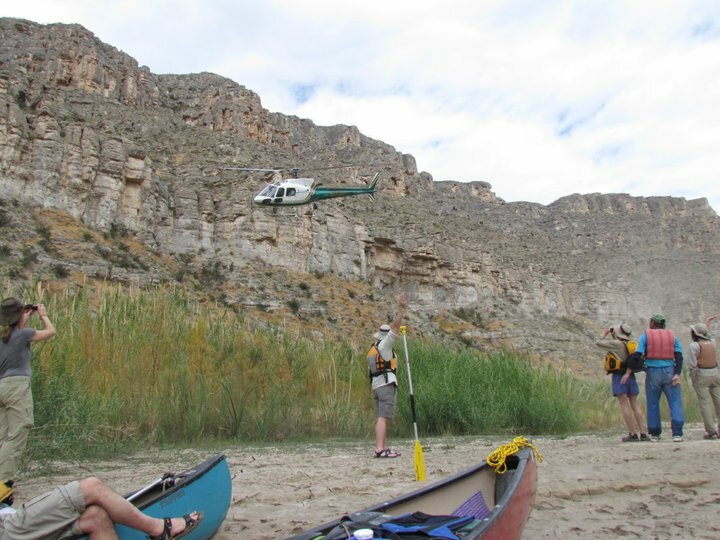 The next day as we broke camp and loaded the canoes, we were buzzed by a border patrol helicopter. We paddled around the first bend and were greeted by a scene from an overly dramatic Chuck Norris television show: the chopper was set down on a sand bar, and standing in the foreground were three men in cowboy hats, two with holsters, and each with arms crossed or thumbs hooked into pockets of their jeans. I remember muttering to my paddling partner that it felt like a greeting practiced for those who did the messing up. But that feeling quickly passed when we pulled our canoes up onto shore. After making sure we were okay, the agents, friendly and open with information, filled us in on some details. Far from backburnering it for a day, they already had investigated it, pinned down the location, and identified the shooters. We did wonder a bit why it took them a day to check directly with us to see if anyone was actually hurt, but we overlooked that in the overall “pleasantries” of the exchange. The offenders had claimed they were only shooting at quail. After we cleared that load of bull up and made clear just how close the bullets had been hitting, we snapped some pictures of us with the agents and chopper, and merrily continued our trip. When they learned of it, the Park Service seemed genuinely upset with the whole episode, and sought to bring charges against the shooters. 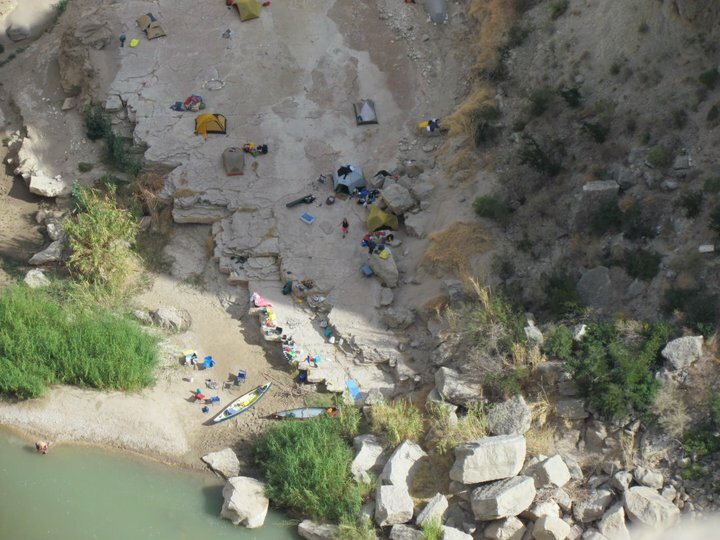 It seemed pretty clear what had happened: a group of “fellow” Americans, with guns, assumed that because we were camped on the Mexican side, that we must be Mexicans, and assumed they could get away with some fun. Not exactly a “Proud to be an American” moment. Not to belittle being shot at, but with no one having been hurt, the event didn’t detract all that much from what was a highly enjoyable and adventurous trip: 11 days and about 120 miles of “wilderness” paddling on the Lower Canyons section of the Rio Grande between Heath Canyon and Fosters Ranch, in the final section of the 196-mile portion of the river designated as Wild and Scenic. The Rio Grande begins in the San Juan Mountains of southern Colorado and follows a 1,885-mile course before it empties into the Gulf of Mexico. Along the way the river and its tributaries drain a land area of the U.S. and Mexico that’s more than twice the size of California. It winds through a widely varied landscape that includes deserts, mountains, and forests, and its home to diverse plants and wildlife as well as about 10 million people. 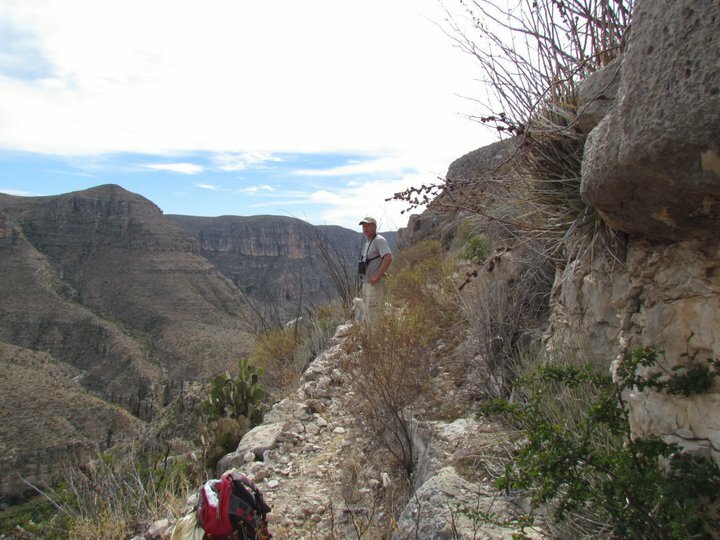 Its roughly somewhere in the middle that the river runs through the Big Bend area of Texas in the Chihuahuan Desert, the most remote and rugged section, deeply incised with canyons. It was here that we paddled. I vividly remember arriving late at night to our campground staging area in early January to begin our trip. My first impression of the Texas backcountry: holy cow, the nights got cold. 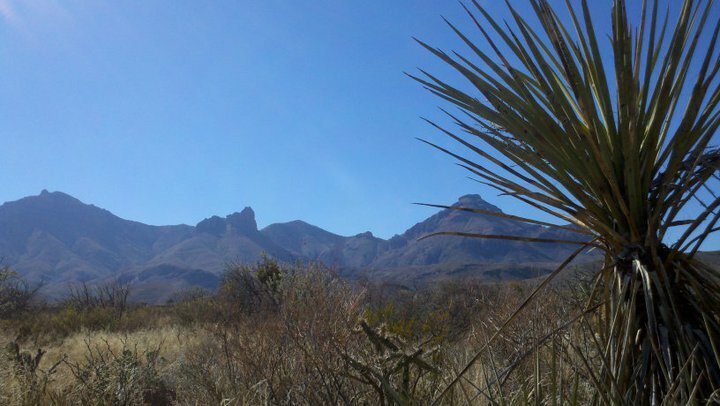 This was my first time in the desert of southern Texas, and I was sorely underprepared with my 40-degree sleeping bag. 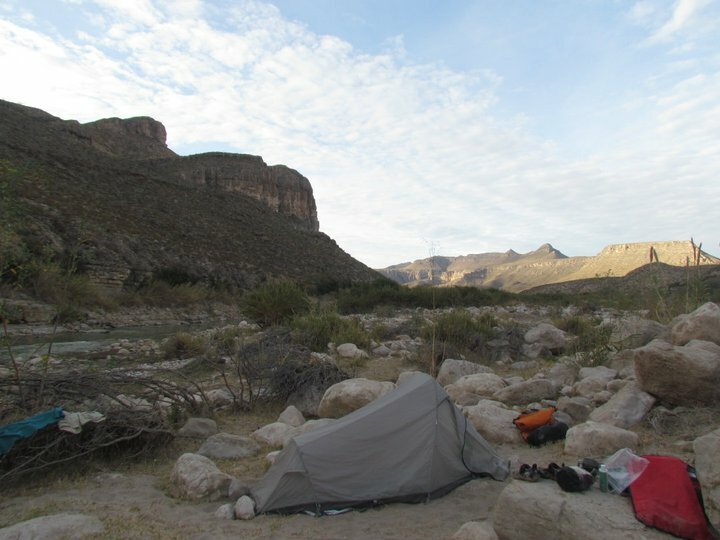 After freezing that first night under every bit of clothing I had draped over my sleeping bag, I felt like I won a lottery the next morning when I uncovered a long-forgotten wool Mexican blanket in the dusty back room of the camp store – it became my constant nighttime companion and it’s no exaggeration to say it made my trip. 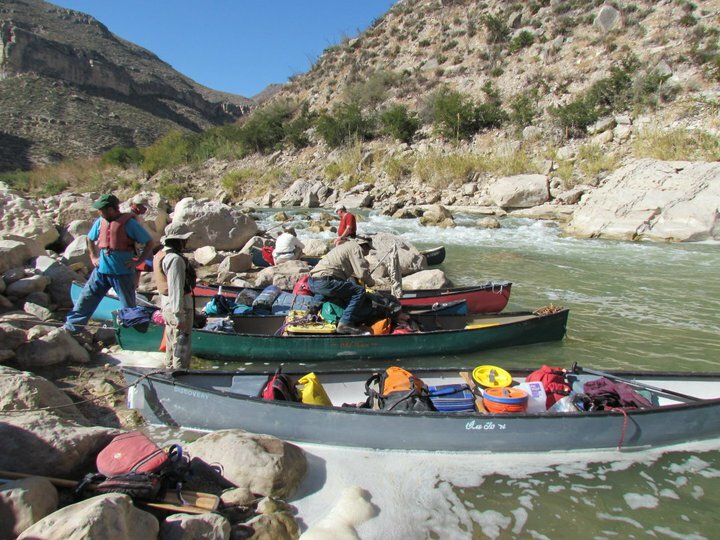 All canoe trips on the Rio Grande in this region begin with a fairly formal registration and orientation from the National Park Service, including having to sign a full waiver and indemnification, and sitting through multiple lectures from park rangers. Our entire trip was paddling where the river was the international border, which obviously adds to the “seriousness” of the undertaking. From what we’d heard in advance about border patrolling and fences and illegal border crossings, we half expected there to be a 20-ft high wall with guard towers along the entire river. It couldn’t have been more different. The park rangers make it clear that you will be in wilderness, and you have to abide by wilderness rules: no open fires and leave no trace camping were at the top of the list. It was “suggested” we camp only on the American side, but told it really wouldn’t matter because of the remoteness of the section we were paddling. There were mountain lions, bears and snakes we needed to be alert for, and we were warned that Mexicans were using several overland routes to run drugs, and we could expect them to be armed and dangerous, so we should avoid solitary figures with backpacks. That was enough to set up some serious irony. Yeah, so we better watch out for those….FOREIGNERS! We slid into the river with heavily loaded canoes, and for the next 11 days had sunny skies, an entertaining mix of fast water, rapids, and flat water that snakes through steep canyons, and amazing views of dramatic desert landscape. What was missing in vegetation was more than compensated for by the diverse topography and geology. 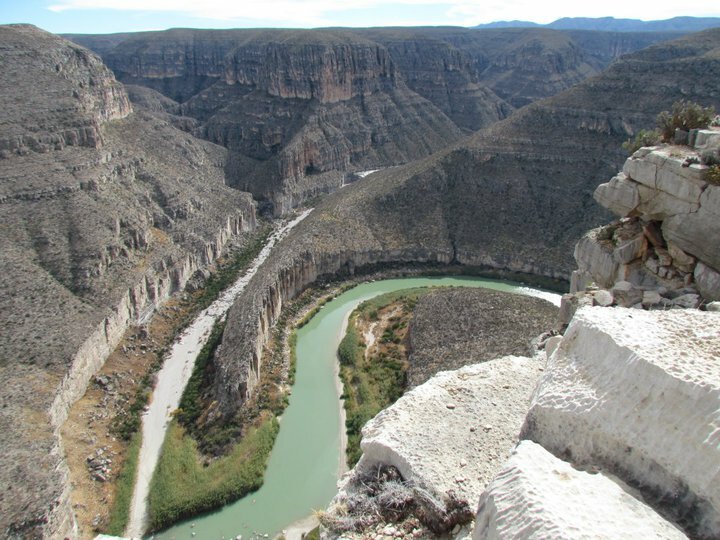 There were sheer canyon walls, with several sections rising straight up from the river over 1,000 feet. Enjoying every moment, we typically paddled slowly through these canyons and said little. 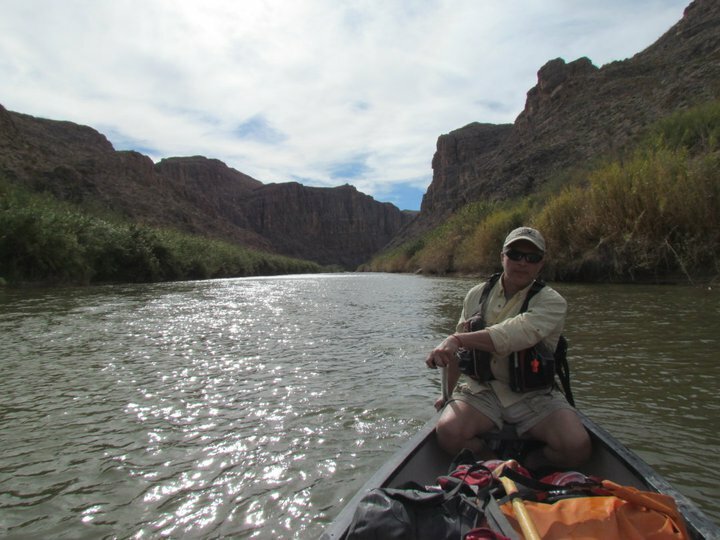 It was easy to let your mind wander to spaghetti western movies, and imagine how easy it would be for “outlaws” to hide and ambush our canoes from the canyon walls looming within easy gun or arrow range. More irony. 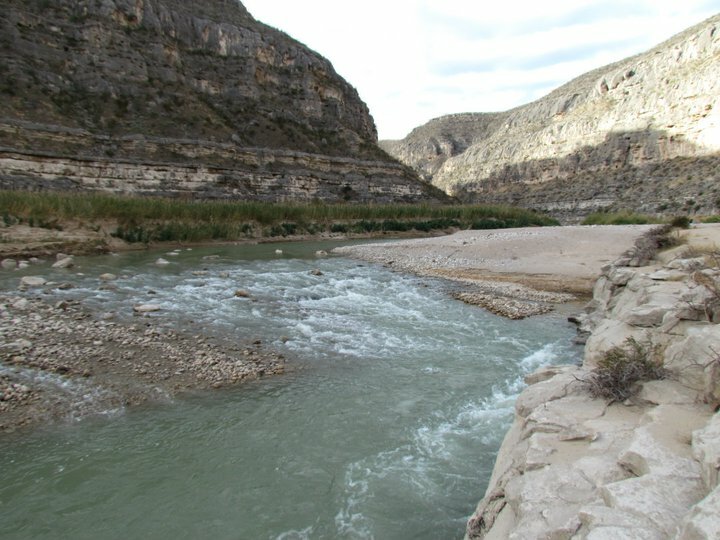 Every side canyon arroyo that dropped to the river was a raging torrent during rare heavy rain events, and where they intersected the river, they spit boulders of all sizes into the Rio Grande. Each was an interesting set of rapids, many fairly challenging. We happened to hit the perfect water level: we never had to drag our canoes through shallows, but the water wasn’t so high that any rapids were life threatening. We had some near flips, but no one swam unintentionally the entire trip. The Park Service brochure rated the rapids in the Lower Canyons section as Class II to IV, but at the water level we paddled we felt the most difficult rapid was probably III. One of the highlights was a section of river with hot springs. Several on the Mexican side had been improved by hand digging and lining with rocks; just deep enough to sit in. Not the hottest I’ve been in, but they got high grades for isolation and scenery. A hot spring pool next to the river. The Wild and Scenic corridor we paddled was referred to as “true wilderness” by the Park Service, but I hesitate to go that far. It’s true that long sections were far from any roads and people. We saw no buildings or road crossings between the put in and the take out. We saw wonderful desert birds and tracks of mountain lions. The heavy preaching by the Park Service of leave-no-trace ethics seems to be working, and there was surprisingly little evidence of other campers. We saw only one other group of paddlers on the river, although we saw them several times as we leap-frogged across each others’ pace. There also were some pretty significant knocks against calling it wilderness in my book. For one, there were cattle ranging in the strangest places…in fact they were by far the most common animal we encountered, often grazing along the shoreline at the base of impossibly steep canyon walls. There also was one major issue that was obvious almost everywhere if you knew what you were looking at – that was how human control of water levels had altered the river ecology. In a natural wilderness condition, the river should be flushed periodically of sediments and sand bars by flood waters of major storms. There are a number of impoundments along the river, however, upstream of the Park region that stifle peak flows, and although there are still fast water sections, much of the river has qualities more similar to a lake. 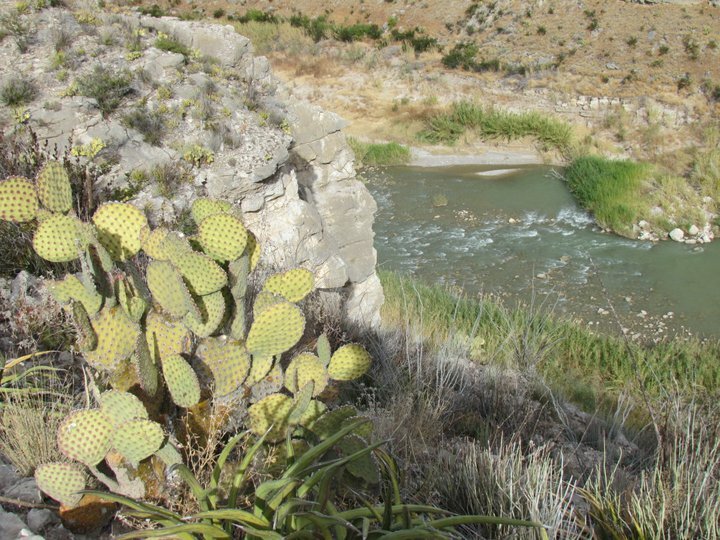 The unnatural buildup of sediments has allowed invasive plants to take hold, and one in particular, giant cane, had taken hold on almost every exposed bank and had formed impenetrable walls in many places. Tamarisk was another invasive plant that was all over the river banks. One final negative was water quality. The water seemed relatively clear, and with the remoteness where we paddled – well you just wanted to believe everything was cool. But upstream were American cities like Albuquerque, New Mexico, and El Paso, Texas, and a large number of Mexican settlements like Ciudad Juarez and Chihuahua. Industry, agriculture, and less-than-effective sewage treatment all worked to degrade water quality. So, no, although we didn’t need to worry that the water was dissolving the plastic from the bottoms of our canoes, let’s just say you need a thoroughly effective filtering system if you want to drink the water. Again, we were warned about possible interactions with Mexicans, and for us it turned out to be one of those things….our own government instilling fear and mistrust. We did meet a few Mexicans early in the trip. Counter to the anticipated strictness of border rules, the individuals we met routinely crossed the river to water their horses at a watering hole on the American side. As far as we could tell, there were no border agents poised to arrest any of them. They were friendly and went about their business. A trail up canyon walls. 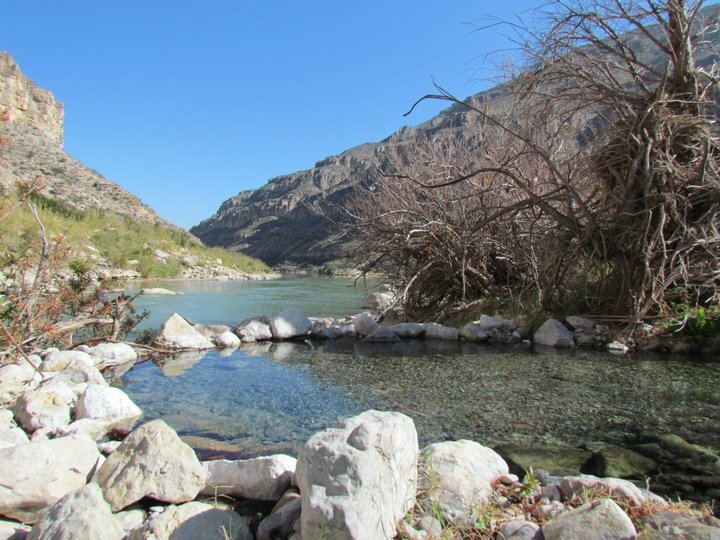 There are some great side hikes off the river, most of which by necessity are in dry arroyos that spill into the river. One exception is a great 2-hour hike up steep canyon walls to Burro Bluff, where you stand at the top of the deeply divided landscape overlooking the river and Tule Canyon – a sight that leaves you speechless. This bluff also, unfortunately must be accessible by land, as it was the location where we were fired upon. You have to be able to laugh at the dust throughout the trip, because if you can’t it might drive you batty. The wind would show up at irregular intervals, and when it did, it picked up plenty of desert dust and sand. If you made the mistake of leaving your tent flap open, you paid dearly for it with a gritty night of sleep. I’m sure that Rio Grande dust will be shaking its way out of my gear for years to come. 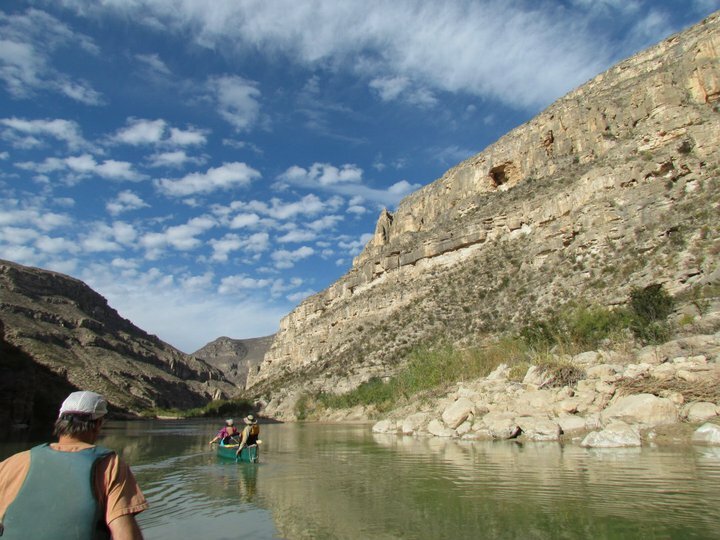 Having canoed wilderness rivers in the far north, there was one attribute that really made the Rio Grande stand out – there were no biting insects. I did get stung by a bee for no apparent reason while eating lunch on a rocky bar, but other than that it was pure deet-free pleasure. 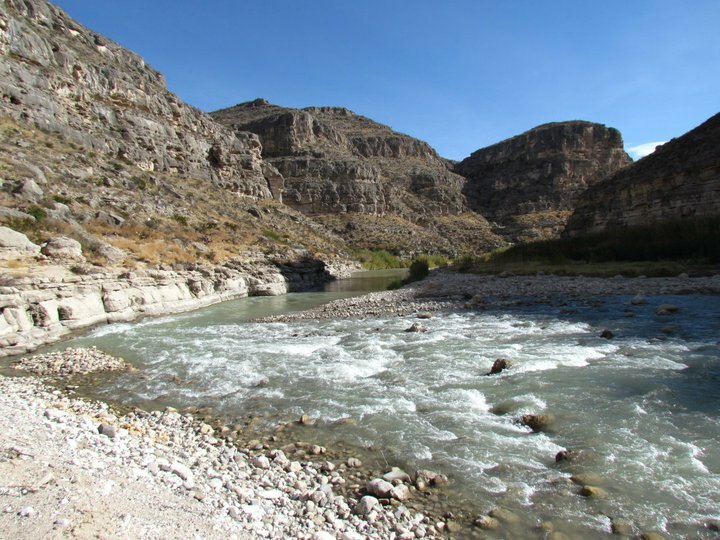 So leave the bug spray at home, pack a garbage can lid for a fire base, and a 5-gallon bucket for your latrine, and prepare to hear some talk about guns and outlaws, and head to the Rio Grande for a truly quality remote paddling experience – call it a wilderness trip with some qualifiers. Most likely the story of the shooting “incident” on our trip has travelled up and down the river and, like lightning, is unlikely to strike again in this place anytime soon. 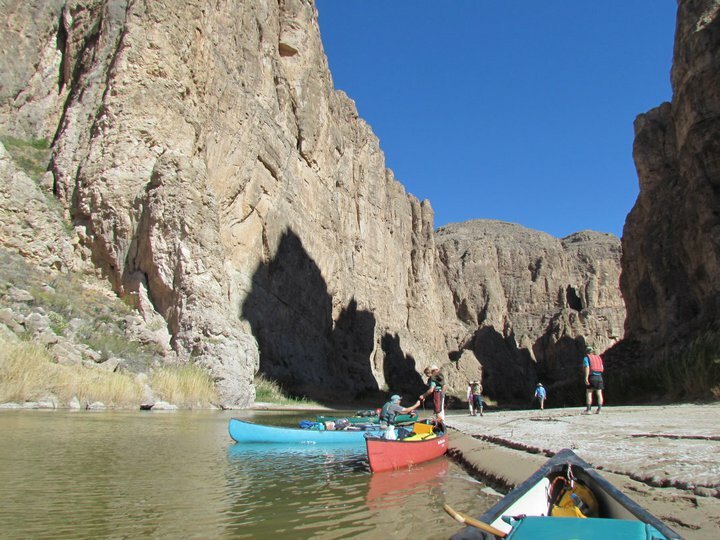 Maybe, though, it will add some intrigue and suspense to your trip to know the Wild West isn’t so far removed after all….and be sure to watch for shadows behind boulders while paddling through those narrow canyons…. If you go: 1. Arrange for any vehicle shuttles well in advance. You can find names online, or check with the Park Service. 2. Be prepared to fully abide by leave-no-trace rules. The experience is amazing and it needs to stay that way for those who follow. 3. Be sure you ask about water levels and you are prepared to deal with whatever you encounter, which can range from plenty of canoe dragging, to fast and deep water with some technical rapids. 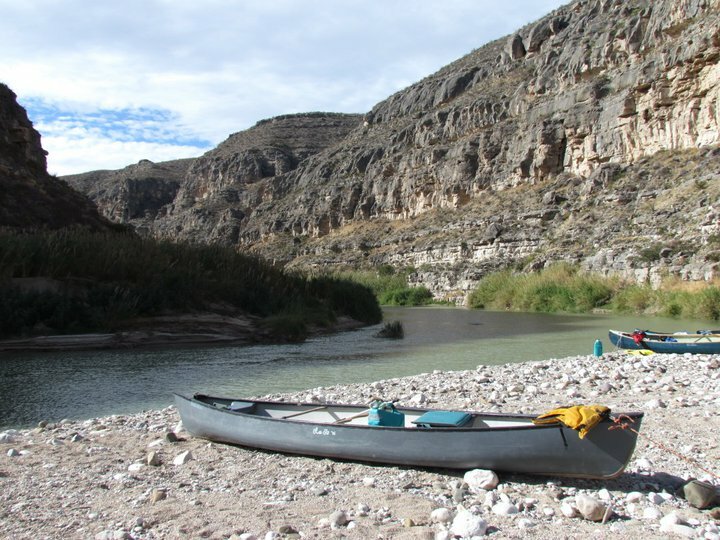 We paddelled the lower section of your Rio Grande trip 31 years ago as part of an extended honey-moon adventure. Thanks for your great pictures that brought it back for us. It was a far mellower time in terms of border intrigue. We sat one evening while we watched a Mexican fellow dressed up in his best Saturday night whites trying to lassoo his donkey that was grazing on the riverbank. When his master approached the donkey retreated to the middle of the river. The Mexican guy got out his row boat, paddled to the donkey, plunked the loop around the donkey’s head and started paddling back to shore. The donkey was pretty unperturbed and merely dug in its heals and stopped the man and the boat in its tracks. After a lot of swearing and tugging, the man gave up, rowed to shore, and walked to town. The donkey watched him disappear and then lackadaisically sauntered back to shore to resume his dinner. What a crazy sad thing it is that we have a racial climate such that a bunch of yahoos think it’s OK to scare people by shooting at them. Glad you continued your adventure. Hope to hear of many more. My Family owns burros bluff I was there when this happened. We were shooting high powered Rifles to make echos. Y’all all need to remember your in Texas we like guns here and we shoot them on our own land. Technically your all trespassing on burros bluff but we’ve allowed it because we’re nice. Y’all all wouldn’t be here if we wanted to shoot at you. Hey Baker, Nice to hear from someone who was there! Seems like a long time ago. At this point, I’d have to say “Thanks man” because its been a really good story to tell people. Also, me, my kids and now my first grandkid say thanks for not hitting us. With high powered rifles, I’m sure you could have. I’m from Maine. Lots of us like our guns too. If someone had told us we needed permission, we’d have done it ahead of time. Wasn’t the case. Seriously, I get it, I really do, but I think if you were on the other end of the barrel, you probably would too. Great spot you have there, wouldn’t mind coming back.